Henna (also known as mehndi) has been used to adorn women for thousands of years for weddings and many other social events. It dates back to women adorning themselves for their meeting of their husbands and also in celebration of childbirths. It was originally widely used across many of lands throughout India, Africa, the Middle East and the Mediterranean. Henna gives off a beautiful natural reddish brown color. It can last for up to four weeks or more depending on location applied. Just about any location on the body can be adorned from head to toe. The designs can be as simple or as intricate as you wish. 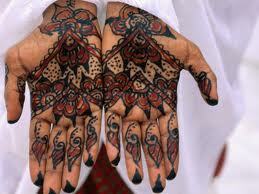 Henna is now used all around the world for any occasion. The best part is it allows you the creativity of self-expression; it’s safe and requires no needles. Which means it’s painless and fun! It’s temporary and will eventually fade allowing more and more options for change. So for all of you out there that said you wanted a tattoo but are too chicken to do it or worried about the safety or whatever your reasons, here’s your alternative, try henna instead!